"ANZAC" and "Anzac" redirect here. For other uses, see ANZAC (disambiguation). The Australian and New Zealand Army Corps (ANZAC) was a First World War army corps of the Mediterranean Expeditionary Force. It was formed in Egypt in December 1914, and operated during the Battle of Gallipoli. General William Birdwood commanded the corps, which comprised troops from the First Australian Imperial Force and 1st New Zealand Expeditionary Force. The corps disbanded in 1916, following the Allied evacuation of the Gallipoli peninsula and the formation of I ANZAC Corps and II ANZAC Corps. The Corps was reestablished, briefly, in the Second World War during the Battle of Greece in 1941. Plans for the formation began in November 1914 while the first contingent of Australian and New Zealand troops were still in convoy bound for, as they thought, Europe. However, following the experiences of the Canadian Expeditionary Force encamped on Salisbury Plain, it was decided not to subject the Australians and New Zealanders to the English winter, and so they were diverted to Egypt for training before moving on to the Western Front in France. The British Secretary of State for War, Horatio Kitchener, appointed General William Birdwood, an officer of the British Indian Army, to the command of the corps and he furnished most of the corps staff from the Indian Army as well. Birdwood arrived in Cairo on 21 December 1914 to assume command of the corps. It was originally intended to name the corps the Australasian Army Corps, this title being used in the unit diary in line with the common practice of the time which often saw New Zealanders and Australians compete together as Australasia in sporting events. However, complaints from New Zealand recruits led to adoption of the name Australian and New Zealand Army Corps. The administration clerks found the title too cumbersome so quickly adopted the abbreviation A. & N.Z.A.C. or simply ANZAC. Shortly afterwards it was officially adopted as the codename for the corps, but it did not enter common usage amongst the troops until after the Gallipoli landings. 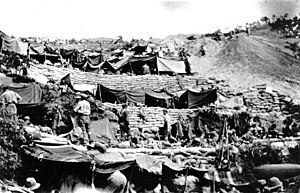 At the outset, the corps comprised two divisions; the Australian Division, composed of the 1st, 2nd and 3rd Australian Infantry Brigades and the New Zealand and Australian Division, composed of the New Zealand Infantry Brigade, New Zealand Mounted Rifles Brigade, Australian 1st Light Horse Brigade and 4th Australian Infantry Brigade. The 2nd and 3rd Australian Light Horse Brigades were assigned as corps level troops, belonging to neither division. Despite being synonymous with Australia and New Zealand, ANZAC was a multi-national body: in addition to the many British officers in the corps and division staffs, the Australian and New Zealand Army Corps contained, at various points, the 7th Brigade of the Indian Mountain Artillery, Ceylon Planters Rifle Corps troops, the Zion Mule Corps, four battalions from the Royal Naval Division, the British 13th (Western) Division, one brigade of the British 10th (Irish) Division and the 29th Indian Brigade. Following the evacuation of Gallipoli in December 1915, the Australian and New Zealand units reassembled in Egypt. The New Zealand contingent expanded to form their own division; the New Zealand Division. The First Australian Imperial Force underwent a major reorganisation resulting in the formation of two new divisions; the 4th and 5th divisions. (The Australian 3rd Division was forming in Australia and would be sent directly to England and then to France.) These divisions were reformed into two corps; I ANZAC Corps and II ANZAC Corps. I ANZAC Corps, under the command of General Birdwood, departed for France in early 1916. II ANZAC Corps, commanded by Lieutenant General Alexander Godley, followed soon after. In January 1916, the 4th (ANZAC) Battalion, Imperial Camel Corps with Australian and New Zealand troops was formed, the 1st and 3rd battalions were Australian and the 2nd Battalion British. Then in March 1916, the ANZAC Mounted Division with three Australian and one New Zealand brigade, was formed for service in Egypt and Palestine. There was also the 1st (ANZAC) Wireless Signal Squadron, which served with the British expeditionary force in Mesopotamia in 1916–17. In early 1916 the Australian and, to a lesser extent, New Zealand governments sought the creation of an Australian and New Zealand Army which would have included the New Zealand Division and all of the Australian infantry divisions, but this did not occur. Monument in Sfakia commemorating the evacuation of British and ANZAC forces from Crete in late May 1941. During World War II, the Australian I Corps HQ moved to Greece in April 1941. As the corps also controlled the New Zealand 2nd Division (along with Greek and British formations), it was officially renamed ANZAC Corps in April. The Battle of Greece was over in weeks and the corps HQ left Greece on 23–24 April, with the name ANZAC Corps no longer being used. Some troops evacuated to Alexandria, but the majority were sent to Crete to reinforce its garrison against an expected air and sea German invasion. Australians and New Zealanders were respectively deployed around the cities of Rethymno and Chania in western Crete with a smaller Australian force being positioned in Heraklion. The invasion began the morning of 20 May and, after the fierce Battle of Crete, which lasted ten days, Crete fell to the Germans. Most of the defenders of Chania withdrew across the island to the south coast and were evacuated by the Royal Navy from Sfakia. Many others evaded capture for several months, hiding in the mountains with generous assistance from the local Cretan population. During the Vietnam War, two companies from the Royal New Zealand Infantry Regiment were integrated into Royal Australian Regiment battalions. These integrated battalions had the suffix (ANZAC) added to their name (for example, 4 RAR became the 4RAR/NZ (ANZAC) Battalion). An ANZAC battalion served as one of the infantry battalions of the 1st Australian Task Force (1 ATF) from early March 1968 until its withdrawal in December 1971. Due to the rotation of forces there were a total of five combined battalions of this period. The ANZAC Battle Group was the official designation of Australian and New Zealand units deployed to Timor Leste as part of Operation Astute. The battle group was established in September 2006. ^ Beckett, Ian (2012). The Making of the First World War. Yale University Press. ^ a b Davidson, Leon (2005). Scarecrow Army: The Anzacs at Gallipoli. Black Dog Books. p. 24. ^ a b Davidson, Leon (2005). Scarecrow Army: The Anzacs at Gallipoli. Black Dog Books. p. 25. ^ a b c d e "The ANZAC Acronym". Australian War Memorial. Retrieved 15 December 2011. ^ "Imperial Camel Corps". Australian War Memorial. Retrieved 15 December 2011. ^ Ewer, Peter (2008). Forgotten Anzacs: The Campaign in Greece, 1941, Scribe Publications Pty Ltd, ISBN 1921215291. ^ D.M. Horner. "Blamey, Sir Thomas Albert (1884–1951)". Australian Dictionary of Biography, Volume 13, Melbourne University Press, 1993, pp 196–201. ^ Crete, Kreta: the battles of May 1941 "Australian War Memorial". ^ McGibbon 2010, p. 550. ^ "ANZAC Battle Group". 24 August 2009. McGibbon, Ian (2010). New Zealand's Vietnam War: A History of Combat, Commitment and Controversy. Auckland: Exisle. ISBN 0908988966. Fleming, Robert (2012). The Australian Army in World War I. Men at Arms. Oxford, United Kingdom: Osprey. ISBN 184908632X. Lake, Marilyn; Reynolds, Henry, eds. (2010). What's Wrong with ANZAC? The Militarisation of Australian History. Sydney: NewSouth Books. ISBN 978-1-74223-151-8. Wikimedia Commons has media related to Australian and New Zealand Army Corps. Discovering Anzacs includes service records and profiles from National Archives of Australia and Archives NZ for those who enlisted in WWI. An ongoing collection of geo-mapped Australian & ANZAC War Memorial photographs. Listen to an excerpt from a simulated recording of Australian troops docking in Egypt after their voyage from Australia to take part in the First World War on australianscreen online. Seal, Graham: Anzac (Australia), in: 1914-1918-online. International Encyclopedia of the First World War. This page was last edited on 13 April 2019, at 08:01 (UTC).